Just wanted to share a page that I did using Ryan's first day of school photos. I used October Afternoon's Schoolhouse line here. Did it for Emma's this week. I have been loving OA lately! And this line was perfect for my pictures. 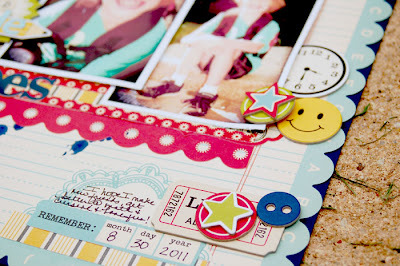 The little chipboard pieces were so fun to add to the page. I especially love the little buttons. Not much else going on here. Hope to have more to share with you later on this week. This is such a pretty back to school layout! I'm loving the colours and your photo editting looks great too. It gives the photos such a vintagy look! Sooooo CUTE!! Soooooo FUN!! LOVE this! Well, guess that you got a typical 3rd grader response, lol! He's so cute, Anabelle... just as this page is! Love that you used primary colors here! I love how you used those colors Anabelle! Such sweet photos of your little guy and love that fun playful feel of the layout!